Nida Ali has finally designed her Rangrez collection 2014 for Eid-Ul-Fitr 2014. This collection includes total 10 beautiful dresses which have fully designed with artistic and explaining looks. Nida Ali has designed these dresses with full of awesome stitching styles. This Nida Ali Rangrez collection 2014 will be exhibiting on 9th July and 10th July 2014. The venue of Nida Ali exhibition is 34/2 32nd street Khayaban-e-Bahria Phase 5 near Saba Avenue. You can visit her exhibition for purchasing these dresses for upcoming event of Eid-Ul-Fitr 2014. Nida Ali is one of the most famous and talented fashion designer of Pakistan. Nida Ali is a fashion designer who has been working since very past years ago. 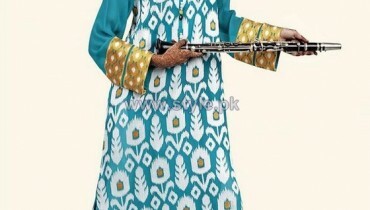 Nida Ali alwyas provide high quality fabrics with finest stitching styles. Nida Ali offers casual wear to formal wear dresses for women. Nida Ali has designed and launched so many collection and her every collection has designed with modernity and high ends. For upcoming event of Eid-Ul-Fitr 2014, Nida Ali has designed a tremendous Rangrez collection 2014 for women. This collection includes dresses in pure silk fabric. Each dress has embellished with multi colored embroidery and laces. Some of the dresses have adorned with digital prints. You can see subtle and sober shades in this collection but also bright shades are seeing in this collection such as beige, blue, red, black and so on. Tie and dye shades are also looking amazing in some of the dresses. Nida Ali Rangrez collection 2014 for eid are fashionable and trendy. Their stitching styles are attractive and perfect for young girls. Let’s have a look at this Rangrez collection 2014 by Nida Ali here below. 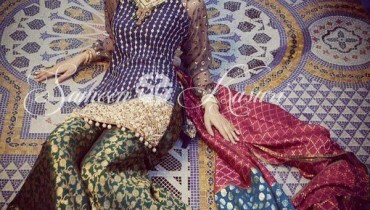 Nida Ali Rangrez Collection 2014 For Eid. Nida Ali Eid Dresses 2014.